When Mercedes-Benz pulled the cover off its C111 at the 1969 Frankfurt Motor Show, the orange gullwinged wedge could have re-written the history of the supercar. It wouldn’t, despite sales staff fending off blank cheques from customers wanting to buy it. Instead, the manufacturer kept the C111 all to itself, building just 16 examples as experimental – and record-breaking – vehicles throughout the 1970s. Not one of those cheque-brandishing customers would ever get the chance to own one. The passing of time has slightly muddied the exact reasoning why the car wasn’t built. Many commentators suggest that it was only ever going to be an experimental machine, while others say that management considered production but got cold feet at producing such a radical car. The C111 was, after all, somewhat at odds with Mercedes-Benz’s famed conservatism. Worries about whether a fibreglass-reinforced plastic body could really feature on a production Mercedes-Benz have also been suggested. However, the biggest, most credible reason cited centres around the model’s radical engine configuration. As with many other manufacturers at the time, Mercedes-Benz was experimenting with Wankel rotary engines. The first C111 at the 1969 Frankfurt show featured a triple-rotor 280bhp Wankel. A few short months later that was subsequently upped to a four-rotor 2.4-litre unit producing 350bhp, which Mercedes-Benz unveiled in the C111 II at the 1970 Geneva Motor Show. The rotary engine (seen below with engineer Rudolf Uhlenhaut), and the inherent early problems of rotor wear, would perhaps preclude production, as would the heavy petrol consumption associated with it. Given the pending fuel crisis of 1973 Mercedes-Benz’s decision looked prudent, even if today it’s tinged with a degree of what might have been. That’s particularly true when you consider the engine’s performance. The quad-rotor set-up allowed the C111 II to reach 0-62mph in 4.9 seconds, the top speed being quoted as 186mph. Consider that a contemporary mid-engined Lamborghini Miura P400S took nearly a second longer to do the same sprint, and stopped accelerating 12mph earlier, and you can see that the C111 II’s performance was sensational in its day. Indeed, even 48 years later a modern AMG GT stops the clock barely a second earlier than its elderly relative. Given the C111 II’s historical significance, rarity and value – today it is conservatively insured for £6 million – it’s a wonder Mercedes-Benz allows the car to leave the manufacturer’s own Stuttgart museum. It has, though; the car is currently at Mercedes-Benz World, Brooklands, UK – and it’s running. However, the sound emanating from the buttressed rear engine cover isn’t the characteristic fizz of a rotary unit, but rather the melodious wuffle of a V8. The original Wankel engine exists, but it’s so precious – and Mercedes-Benz Classic is so limited in parts for it – that it’s shelved, quite literally, in the company’s sensational ‘holy halls’ storage in Stuttgart. The V8 that replaces it is a 3.5-litre M116 that would have powered a R107 350SL back in the 1970s. The cars that undertook testing back then had this engine swapped in, so its fitment is not only period correct but historically accurate. With just 200bhp at 5800rpm and 286Nm at 4000rpm, it’s down some 150bhp over the Wankel it replaces. Nor does the V8 rev to the dizzying 10,000rpm that’s tantalisingly indicated on the C111 II’s revcounter ahead of me; instead, a red line is painted at 6500rpm. Any slight regret at the heart transplant is tempered by the fact that the V8 has created the opportunity to drive the car. The C111 II is here to be experienced, and I’m sat on the driver's seat, with the large steering wheel in front of me and the engine running. Given the model’s experimental status, the cabin is surprisingly well finished and complete, with simple white-on-black VDO instrumentation. The odometer’s reading of over 18,000km underlines that this car was genuinely used. To the right of the steering wheel there are gauges for fuel, water temperature, oil pressure and temperature. Controls for the heating and air-conditioning systems sit underneath, along with a Becker Grand Prix stereo stood vertically in a DIN slot. The A/C and stereo are significant, this C111 II being used to develop both, while the windscreen surround betrays the fitment of an early, integrated radio antenna. The view out is atypical of a sports or supercar, particularly a mid-engined one. That’s deliberate, and the reason why in translation from the original C111 to this second model the rear engine cover’s structure gained open buttresses, to improve over-the-shoulder visibility. The screen surrounds are impossibly thin by today’s standards, which is doubly impressive when you consider that the doors are gullwing items, with the hinging all neatly integrated into a recess in the roof. It’s a sensational-looking car. The body is unadorned with the superfluous, while the paint colour referred to by the Mercedes-Benz Classic chaperone as Rose Wine was apparently picked not to be overt or ostentatious, but for safety reasons. This car gained deeper cowls for the front-mounted radiators. These are painted in contrasting black, which helps highlight their form, and the rear engine cover is similarly coloured. If the front is dramatic for its long snout and pop-up headlights, the almost Kamm-tailed rear provides arguably the C111’s finest view. Simple round taillights are joined by slats with a number plate nestling between them, above which sits a three-pointed star. Only those pop-up headlights and the tiny 15-inch alloy wheels shod in balloon-sidewalled Michelin XWX tyres betray the C111 II’s age. This car still looks fresh – contemporary, even. There’s simplicity to its lines, a Germanic efficiency rather than flair and drama. That’s despite the design being credited to Italian Bruno Sacco, who worked under Friedrich Geiger, the then-head of styling at Mercedes-Benz – and also the man responsible for the 300 SL’s signature gullwing doors. Those doors are replicated here, on the C111 II light. Reaching up and pulling them down to close is easy enough. They need a decent tug at the end of their arc to latch properly, doing so with a satisfying click. The engine is smooth, with first ratio needing a push of the solenoid switch on top of the delicate lever to allow access to the dogleg on the bespoke ZF gearbox. The clutch is well weighted and the pedal spacing ideal to allow heel-and-toe downshifts. Thanks to the amount of play across the gearstick’s lengthy throw, the movement of the five-speeder needs measured practice to ensure accuracy. This really is ‘pinch yourself’ stuff, made more unlikely because – accompanied by a Mercedes-Benz Classic chaperone – I’m not pulling out into a Stuttgart street, or limited to a few moments on a test track, but heading out to mix it with the traffic in Weybridge, Surrey. It’s the unlikeliest of scenarios, but one that’s actually happening. Given that the C111 II is both vintage and a supercar, it’s an absolute cinch to drive – which must have helped in its roles as a development and record-breaking machine. That earlier-mentioned visibility is key, affording a view out that’s only now being replicated in mid-engined cars such as McLaren’s 720S. Slipping into the ebb of the busy streets with ease, it idles happily. I keep one eye on the dials for any tell-tale problems, the other vigilant for anyone getting too close. Those dials are resolute in their settings, and thankfully that Rose Wine paintwork seems to be doing its job. Even the air-conditioning has a go at cooling the interior; it’s working, not particularly effectively, but enough to take the edge off the midday sun. The car rides beautifully, although I’ll not deny a sense of relief when puling back into Mercedes-Benz World Brooklands and getting away from the traffic. The handling track is mine, as my chaperone looks nervous and suggests ‘no drifting’. As if we’d be so uncouth – even if the test track does give the opportunity to stretch the C111 II’s legs a bit more than is possible on the road. The suspension features wishbones and struts up front, with anti-dive links and a multi-link rear set-up. Innovative stuff that was used subsequently on production models, but it does, however, underline how far we’ve come with suspension technology today. There’s a lot of body movement as the car rolls and pitches. It’s not unsettling, though; indeed, the steering is communicative and light, while the rear remains stable unless provoked. The disc brakes stop decently, too, although this is hardly surprising given that one of the C111 II’s many tasks back in the 1970s was developing ABS systems. It didn’t stop there, either. The C111 II became the C111 II D, a developmental test bed for turbocharged, intercooled turbodiesels throughout the 1970s. 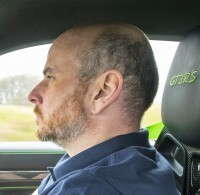 It set 16 world records over 60 hours with four drivers, while its 190bhp OM617 five-cylinder diesel engine achieved a 252km/h (156mph) average over the entire test time. Typically, the engineers couldn’t resist pushing boundaries. In 1979 the C111 in its ultimate MkIV guise gained a 500bhp, twin-turbocharged 4.8-litre petrol V8. Wearing a body reminiscent of a streamliner car, it set an ultimate closed-lap record at Nardo, in southern Italy. Driven by Dr Hans Liebold, it managed 403.9km/h (250.4mph), smashing existing records by around 50km/h. In the process it also recorded 320.6km/h (198.7mph) over 10km; 335.4km/h (207.7mph) over 10 miles; 375.6km/h (232.8mph) over 100km; and 367.3km/h (227.7mph) over 100 miles. Remember, this was in the late 1970s. The C111 was an extraordinary car, and the sighs of relief in Italy when Mercedes-Benz decided not to take any of those cheques must have been palpable. While the brand’s conservatism in not selling the C111 saw the model relegated to a footnote in automotive history, it was a sensational footnote – and remains so to this day. Nice `79 Mercedes with only 124.462 miles! The bodywork is fine, is uncorroded and has good fitting body-panels. The original underbody is uncorroded. It has been finished in a very attractive colour scheme with lovely brown leather trim and beige soft-top. In short; a nice W107 with an attractive price tag! THIS VEHICLE IS IN OUR STORAGE, VIEWING BY APPOINTMENT ONLY.